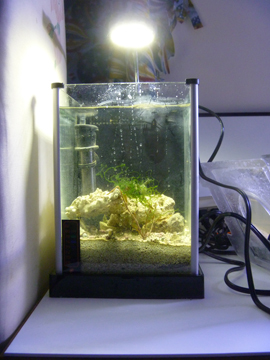 Editors Note: This post was updated 04/16/2012 and added a picture of the author’s own 10 gallon tank instead of the stock picture that was there. Whether I was actually ready for fish sort of depends on your particular definition of “ready”. A lot of stuff has happened since I last wrote, I went through many ‘changed my mind’ moments, rethought through things, spent money I needed to, wasted money I shouldn’t have because I was in too much of a rush, and had a couple of humbling moments where I had to stop and admit that I don’t remember as much as I used to know and that I needed to take the time to “relearn”. Because relearning things is not beneath me, except in my own selfish pride/ego/whatever. The nice thing about the Fluval is that it (like many others) is all built in (minus a heater) and it uses LEDs for lighting. I keep mine about 76 degrees Fahrenheit so evaporation happens quickly. 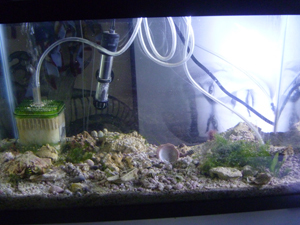 I replaced both the betta bowl and the fish bowl with a Aqueon 17755 10 Deluxe Kit Aquarium . Or at least I would have if I had exercised one iota of sense. No, instead I bought just a tank, then added everything else little by little. This is what was in my tank. Anyway, my apologies for making this look more like a sales catalog than a post, but if you need any of that stuff, those are the links that will take you there. Like I said, I changed a bunch of stuff around and I’ll tell you about that next time. 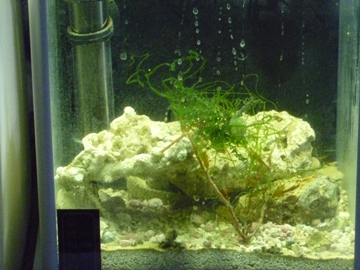 This entry was posted in Aquarium Set up, Freshwater Tropical, Saltwater Invertebrates and tagged 10 Gallon Tank, Apologies, Aqueon, Christmas, Christmas Gift, Closer Look, Deluxe Kit, Desktop Aquarium, Editors, Ego, Evaporation, Fahrenheit, Fish, Fish Bowl, Fish Gallery, Florescent, Glass Aquarium, Iota, Light Strip, Lot, Marineland, Mistake, Money, Nice Thing, Rush, Sales Catalog, Selfish Pride, Tank.